Texas palmettos are native to extreme South Texas, although they are cold hardy enough for use in all but extreme north Texas. 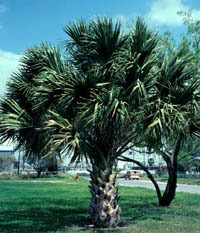 Wild Texas palmettos used to be much more wide-spread before extensive land in the lower Rio Grande Valley was cleared. Now they are relatively rare, but they are widely planted as an ornamental. They can eventually become large palms, with a stout trunk, but they are slow growers. Additional Comments: The last native groves of Texas palmetto are in the Audubon Sabal Palm Grove Sanctuary in Cameron County.